Book with us your trade fair and exhibition in London and UK. 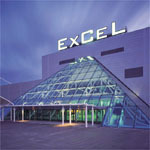 The complete listing of UK trade Shows, Events and Venue search. Exhibitions listed by dates and subject. Our multilingual team are the finest available and fully commercially trained. They can organize an exhibition stand so that you can easily establish new global business contacts. We provide quotations for conference services and make sure you maximize the potential returns and leads for your company. We host a business product launch and provide support for corporate events. Linguists accompany businesses to overseas exhibitions, or other business purposes such as the inspection of potential property purchase. We can quote a daily rate for the translation services.